Fast forward 3 years and a break up, and some might say I haven’t learned my lesson. 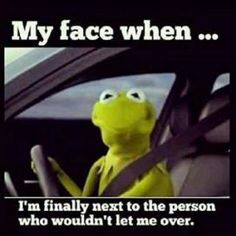 If you’ve been in the car with me you know the left lane is my haven of speed. I have become one of those swearing, gesticulating people who punish the plebeians driving slowly in the fast lane. “It’s called the fast lane for a reason buddy,” I may mutter while weaving or darting in and out of traffic, searching for an open patch of asphalt on my personal Autobahn. But, according to Virginia Code, I may have actually learned my lesson. What does all this legal jargon mean? Do not drive slowly in the left lane. I wish my car would transform into Bumblebee. This code legitimately means that if you’re in the far left, driving with traffic, and someone is quickly coming up from behind, you must move over and allow them to pass. According to this code it is also perfectly legal to audibly signal, i.e. honk, to tell drivers to move over. (495 is about to get louder whenever I drive to Tysons.) Now, we all know that this rarely happens in Virginia (not the honking, but the moving over). 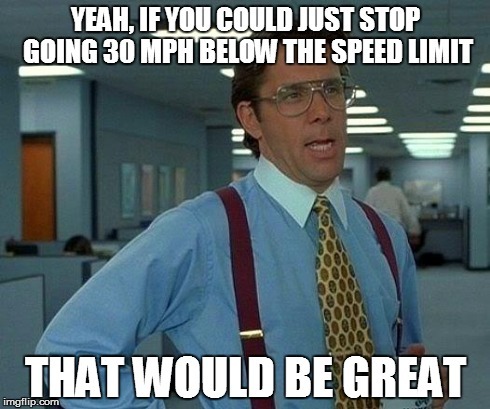 Oftentimes, people in the left lane sit there, impeding those people willing to drive at reckless speeds. What they don’t realize is that by sitting there, they are breaking a Virginia law and they are causing more dangerous road conditions. You see, these codes are in place because humans are just that, human. We’re going to speed, we’re going to get angry, and that’s when mistakes happen. If you have relatively slow drivers scattered between lanes it forces faster drivers to repeatedly slow down and weave back and forth between lanes. Lane changes are dangerous and if you use the left lane as a passing lane only, or allow others to pass you, you cut down on the amount of lane changes. Furthermore, studies have shown that it is more dangerous to slow down to lane change than it is to speed, because the strongest indicator of an accident is variance from the average speed. Going 5mph slower than the average flow of traffic has been shown to cause more accidents than driving 5mph faster. So what are we saying? We’re not telling you to speed, weave in and out of traffic, honk, or tailgate. Just because the law states that those driving in the left lane should yield does not mean you should take advantage and go 90 on the beltway. In fact, police would rather pull you over for reckless than the other guy for “slowpoke” laws. All we’re pointing out, is that it is safer to drive in the right lane unless you are passing. Doing this cuts down lane changes, which will help decrease the number of accidents on the road. All we want is more safety on the roads, whether that be cutting down on the amount of distractions while driving, or following proper highway passing protocol. As always, this is not legal advice, nor driving advice. Though I may take my own advice and slow down and stay out of the left lane from now on.